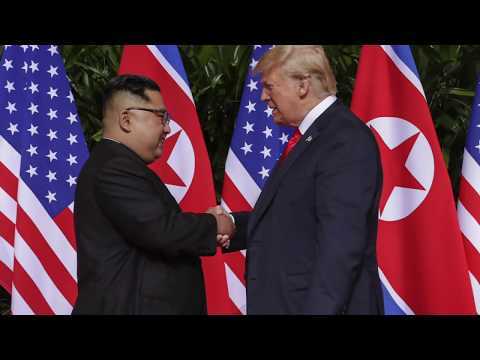 President Trump met with North Korean leaders at a momentous summit in Singapore this past week, assuring the American public that they can “sleep well” knowing that North Korea and its leader Kim Jong Un are no longer a nuclear threat, despite producing no details on how or when weapons might be eliminated, or even reduced. Trump agreed to several North Korean requests, including a halt to all military drills in South Korea. Mike Pompeo, our Secretary of State, was more measured in his response to the historic summit, cautioning that the U.S. would resume “war games” with close ally South Korea if the North stops negotiating in good faith. North Korean state media heralded claims of a victorious meeting, and photos of Kim side-by-side with Trump were splashed across newspapers throughout the region. Trump also made headlines after he was seen saluting a North Korean general, and with his continual praise of the abusive dictatorship. Washington County Commissioner Mitch Meredith has decided he’d rather be a member of the school board than the Commission, and plans to resign from his elected position so he can become eligible to run for a seat on the county’s Board of Education in the Aug. 2 election. Meredith, who also serves as the county’s director of finance and administration, said he was contacted by Coordinator of Elections Mark Goins on Thursday and told that he would have to resign from his commission role to keep his name on the August ballot. Meredith announced by text that he would definitely resign from his commission seat before Aug. 2. In other election news, Carter County Mayor Leon Humphrey announced this week that he will not sit idly by as Republican Primary winner Rusty Barnett runs for his office on August 2. He has declared himself a participant, and is hoping to win as a write-in candidate. Washington County Sheriff’s Investigator Jeff Miller testified Thursday that last week’s point-blank shooting of Christopher Scott Connelly was most likely the result of a $150 cocaine debt. Aaron Christopher Story appeared in court on a first-degree murder charge in the June 2 shooting, as Miller took the stand and offered the courtroom details of the investigation, which included Story’s confession and reasoning for taking Connelly’s life on Dry Creek Road. According to Miller, Story had been taken for $150 by a man with dreadlocks, as well as Connelly and another man named David Parker. Once he realized the $150 cocaine deal made with the man with dreadlocks wasn’t going as planned, Story picked up Connelly in his SUV and drove around the area searching for the man. As time passed, the two pulled over at the ATV parking lot at the top of the trail at Dry Creek, and Connelly was then fatally shot in the back of the head. Story’s account of the event had Connelly attacking him, struggling for his gun, and then accidentally being shot as a result. To find out if the evidence supports that account, and to follow along with the court case as it unfolds, get started with Becky Campbell’s article on our website.